Strawberry Yogurt Pie recipe made with yogurt and cream cheese in a Vanilla Wafer Crust, topped with whipped cream and sliced strawberries is irresistible. I came up this recipe many years ago when I wanted to add more calcium to my diet. Not only does yogurt have an abundance of calcium, it has a plethora of other health benefits. What a bonus to eat a delicious desert that is so healthy for you. ou may want to make two or three at a time and eat one now and freeze the others to eat later. Prepare crust and set aside. *A quality brand of yogurt that is thick and not runny works the best with this recipe. Whip cream cheese in mixer on low speed for two minutes. Gradually add powdered sugar. After all sugar is mixed well, add yogurt and turn speed to medium. You may need to turn speed to high for a minute or two. Pour into crust and smooth top. 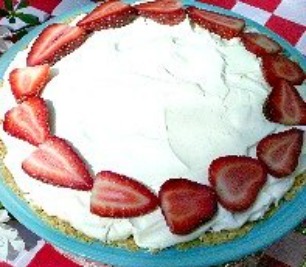 Spread on Homemade Whipped Cream (awesome with this pie) or thawed frozen whipped topping. Slice strawberries and arrange on top in an attractive design. Chill in refrigerator for several hours or overnight to allow pie to get firm. Mix crumbs and butter in a 9" microwave safe pie pan. If you plan to freeze it, also use a freezer safe dish. When mixed well, spread mixture evenly with your fingers in the bottom and on sides of pan, patting down as you go to form the crust. To prevent the buttery crumbs from sticking to your fingers, lay a sheet of plastic wrap over the top of the pie pan before patting down. Remove plastic wrap. Microwave 1 minutes. Set aside to cool. When cool, dust bottom of crust lightly with powdered sugar. This helps prevent the pie shell from becoming soggy, without adding too many calories. Tip: You may substitute any favorite flavor of yogurt and fruit you choose. Lime Yogurt Pie, with fresh lime zest sprinkled on top is an excellent choice.